Adding blueberries to ground turkey not only adds complementary flavor, it also adds great nutritive value as well. Traditional Asian seasonings give this unique burger and its accompanying blueberry ketchup an overall flavor that's hard to beat. For Blueberry Ketchup: In a medium saucepan over medium heat, combine blueberries, onion, vinegar, sugar, ginger and salt. Bring to a simmer; cook about 15 to 20 minutes, stirring frequently. Remove from heat and allow to cool. Transfer cooled mixture to blender or food processor; whirl until smooth. 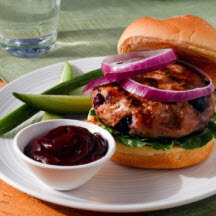 For Blueberry Turkey Burgers: In a large bowl, combine turkey, blueberries, ginger, lemongrass and black pepper; mix well. Brush soy sauce on both sides of burgers. In an oiled skillet over medium-high heat, pan-grill patties until cooked thoroughly, about 4 minutes each side. Serve on buns with lettuce, sliced red onion and blueberry ketchup. *Peel away woody outer layer from the bottom portion of the lemongrass stalk; mince inner flesh. Recipe and photograph are courtesy of the US Highbush Blueberry Council. Used with permission.